It was just Christmas a few months ago and before we knew it, summer has come to pass. Yeah, it's already the month of June, but that doesn't mean the beach lovin fellas will stop going to the beautiful islands of the Philippines. When we talk about the beach, I'm sure you're all with me in wanting to still care for our skin. We definitely wouldn't want to get sunburn and flaky skin, right? Good thing is, there's this new product from Nivea called the Nivea Sun Protect & Refresh Invisible Cooling Mist. 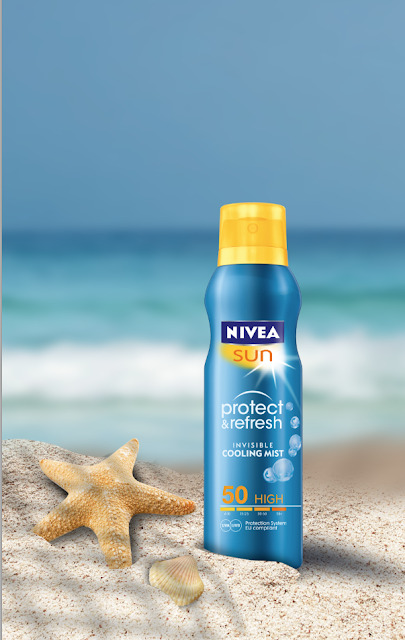 The cooling mist is Nivea's first aerosol sunscreen that combines immediate sun protection and pleasurable freshness. It has a high-level of UVA/UVB protection system at SPF 50 and it's also water-resistant. Spraying it onto my skin leaves no traces of the usual white marks and sticky feeling, seeming like I didn't put on any sunblock at all. What's more is that it really leaves a cool and refreshing feeling onto the skin, coupled with a fragrance like a baby. With the Nivea Sun Protect & Refresh Invisible Cooling Mist, I can definitely say "AHHHH" with freshness amidst the heat of the sun. Now, maybe some of you want to do the AHHHH too for a chance to win Php50,000 shopping spree from American Eagle Outfitters or get brand new Ray-Ban sunglasses? Sure you want it! Do your best AHHHH moment and submit your entry on or before June 7! Visit NIVEA’s Facebook page (www.facebook.com/NIVEAPhilippines) and click on the #DoTheAHHHH app for more details.